After all my thirty years at the museum, I am still slightly amazed how the Babe Ruth ‘brand’ continues to hold its top-rung spot in the sports heritage universe, as well as the world of sports collectables. Just the other day a rare photo of the bat-wielding slugger in his Red Sox uniform made the internet rounds, setting off all kinds of excitement. Last month, Ruth’s road Yankee’s uniform went for a record $4.4 million. 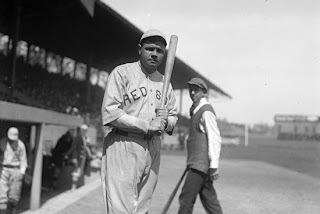 Sports fans and collectors just don’t seem to be able to get enough of Baltimore’s Bambino. I just wish there was a turn-back-the-clock machine so I could witness the Ruthian whirlwind in up- close-and-personal living color! Every year the Babe Ruth Birthplace Foundation hosts a gala fundraiser to support our mission of preserving local sports heritage, and this year’s edition promises to be something special. On September 5, at the Baltimore Hilton at Camden Yards, we will salute Cal Ripken and Eddie Murray, two of the most iconic and beloved Orioles of all time. “An Evening with Cal and Eddie” promises a unique, first-hand opportunity for fans to enjoy the candor of a fireside chat between these Hall of Fame baseball brothers. WBAL’s Keith Mills will moderate the program, with several VIP guests set to pop in. Tickets went on sale this week, and you can get yours by calling the museum at 410-727-1539. Reserve your spot today for what promises to be an once-in-a-lifetime experience. I hope many of you can stop by the museum’s booth at the upcoming National Sports Collectors Convention in Baltimore August 1-5. We will be featuring some rare Ruth and Baltimore sports artifacts that should make your visit well worth the effort. Thanks to Ray Schulte for his kind assist with this project. Back in January I prognosticated that 2012 just might be the “Year of Our Birds.” And while the boys of Buck Schowalter may not be pennant bound, they certainly have provided Baltimore fans with a satisfying first half of a season. As I wrote six months ago, it is always all about pitching, pitching, pitching, so if the team can somehow straighten out the starting rotation, we might still be root-root-rooting come September. The team’s winning start, by the way, has jumped average attendance by about 4,500 per game, the third highest climb in the majors this year. Here’s hoping the show goes on!